For what thanks can we render to God again for you, for all the joy wherewith we joy for your sakes before our God; Night and day praying exceedingly that we might see your face, and might perfect that which is lacking in your faith? Now God himself and our Father, and our Lord Jesus Christ, direct our way unto you. And the Lord make you to increase and abound in love one toward another, and toward all men, even as we do toward you: To the end he may stablish your hearts unblameable in holiness before God, even our Father, at the coming of our Lord Jesus Christ with all his saints. "The light of the body is the eye: therefore when thine eye is single, thy whole body also is full of light; but when thine eye is evil, thy body also is full of darkness. Take heed therefore that the light which is in thee be not darkness. If thy whole body therefore be full of light, having no part dark, the whole shall be full of light, as when the bright shining of a candle doth give thee light." And as He spake, a certain Pharisee besought Him to dine with Him: and He went in, and sat down to meat. And when the Pharisee saw it, he marvelled that He had not first washed before dinner. And the Lord said unto him, "Now do ye Pharisees make clean the outside of the cup and the platter; but your inward part is full of ravening and wickedness. Ye fools, did not he that made that which is without make that which is within also? But rather give alms of such things as ye have; and, behold, all things are clean unto you." As friend and companion of Demetrius/ thou wast an invincible athlete of godliness./ By divine help thou didst conquer Lyaios,/ and in being slain became a holy sacrifice to Christ. In Ireland's fertile soil thou didst plant the seeds of monasticism, O Father Abban,/ and didst nurture a great flowering of God-pleasing virtue./ Continue steadfastly in thy enduring love, to lead mankind to God/ and by thy prayers may we be granted great mercy. O Father Otteran, thou wast the first among the saintly Columba's disciples to repose/ and be laid to rest in the blessed soil of Iona./ As in thy life thou didst live only for Christ,/ we pray thee to intercede for us that we may follow thee into the way of salvation. Through trials and temptations thou didst shepherd/ the monastics of Senboth-Fola, O Father Colman,/ and didst guide many souls on their pilgrimage to Christ./ Wherefore, we pray thee, intercede with Him, that our souls may be saved. 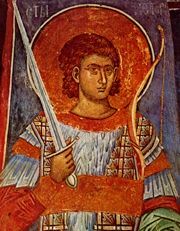 Thou hast won thy contest and inherited eternal glory,/ and didst become a soldier of Christ/ through the prayers of Demetrius./ With him, O wise Nestor, unceasingly pray for us. At the time of the martyrdom of St Dimitrios the Outpourer of Myrrh, there was in Constantinople a young man, Nestor, who had learned the Christian faith from St Dimitrios himself. At that time, the Emperor Maximian, an opponent of Christ, ordered various games and amusements for the people. The Emperor's favourite was a Vandal called Lyaeus, a man of Goliath-like size and strength. As the imperial gladiator, Lyaeus challenged men every day to a duel and slew them, and this blood-letting of his delighted the blood-lust of the idolatrous Emperor. He built a special arena, like a terrace on pillars, for Lyaeus's duels. Underneath this terrace were planted spears with sharp cutting-edges pointing upwards. When Lyaeus had overcome someone in the duel, he would push him from the terrace above onto the whole forest of prepared spears. The pagans stood around with their Emperor, and were delighted when some poor wretch writhed in torment on the spears until he died. Among Lyaeus's innocent victims were a large number of Christians, for, when there was a day when no-one came forward voluntarily to duel with Lyaeus, then, by the Emperor's orders, Christians were compelled to fight with him. Seeing this horrifying enjoyment of the pagan world, Nestor's heart swelled with pain and he resolved to go himself to the arena of the gigantic Lyaeus. He first went to the prison where St Dimitrios was kept, and asked his blessing to do this. St Dimitrios blessed him, signed him with the sign of the Cross on forehead and breast, and said to him: 'You will overcome him, but you will suffer for Christ.' The young Nestor then went to Lyaeus's arena. The Emperor was there with a large crowd, and they all bewailed the probable death of the young Nestor, trying to dissuade him from fighting Lyaeus, but Nestor crossed himself and said: 'O God of Dimitrios, help me!' With God's help, Nestor overcame Lyaeus, felled him and threw him down onto the sharp spears, where the heavy giant soon found death. Then the whole people shouted: 'Great is the God of Dimitrios!' But the Emperor had lost face before the people, and, mourning his favourite, became filled with wrath against Nestor and Dimitrios, and the wicked Emperor ordered that Nestor be beheaded with the sword and Dimitrios run through with spears. Thus this glorious Christian hero, Nestor, left behind his young, earthly life in 306, and entered into the Kingdom of his Lord.